Michael Leal is in his fourth year performing in the PurrCussion drumline at Carolina Panthers home games. Firing up the fans is exhilarating and rewarding. But playing to excite others took on new meaning as he rocked military personnel at five bases across Southwest Asia. 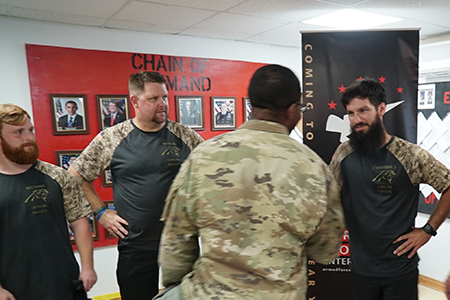 Armed Forces Entertainment organized the Panthers military tour. Leal, a Duke Energy IT analyst, teamed with the Panthers mascot Sir Purr and a partial cast of six TopCats cheerleaders and six PurrCussion drumline members. Duke Energy employee Michael Leal on right. All photos courtesy of the Carolina Panthers. 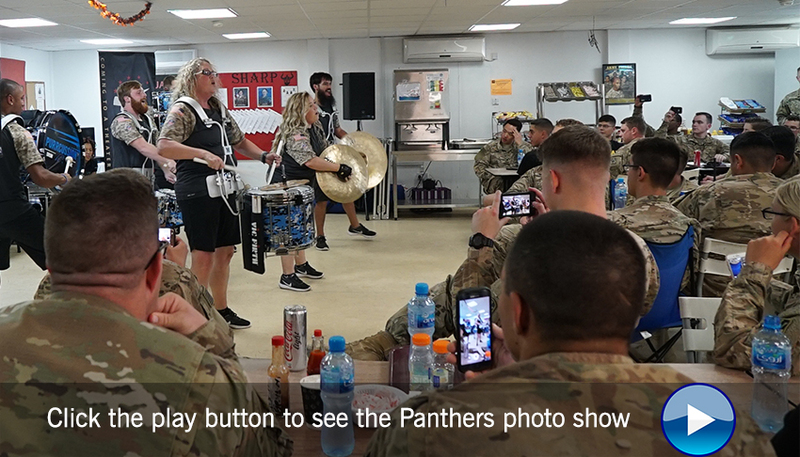 The Panthers ensemble played to more than 600 service personnel and family members in Southwest Asia during the Panthers recent bye week. The mood was festive though fall temperatures hovered around 95 degrees. At dusk in late afternoon, the Panthers took to the stage. Sir Purr hugged and high-fived the crowd. PurrCussion opened with the stirring beat of two songs. TopCats then performed choreographed dances followed by a PurrCussion and TopCat duet. Portions of the show featured audience participation. Members of the crowd showed off their moves in the touchdown dance competition. Others jumped rope to the sound of a snare of the drum while blindfolded. Sir Purr, dressed in red, white and blue, conducted a magic show. “Before we could finish asking for volunteers, troops were rushing to the stage. It was rewarding to see the crowd having such a fun time,” Leal said. The highlight of the entertainment was “Letters from Home.” Throughout the performance, a TopCats or PurrCussion member would read handwritten letters from Panthers players and coaches. The last letter was from coach Ron Rivera. During the autograph session, seven people received a laminated copy of the card that was read during that show. At each base, the Panthers Entertainment group got to meet and greet with various functional and tactical divisions. Leal was impressed with their professionalism, technical expertise and commitment to their call of duty. “It was humbling to sit with 18- and 19-year-olds along with veterans of 25 or 30 years. Some were active duty and others reservists. I felt a deep sense of appreciation for the sacrifices they and their families make every day on behalf of our country. One base had a school for children of military personnel on extended deployment terms, and Sir Purr was a big hit as he took to the classroom as the substitute teacher. The Carolina Panthers and United Service Organization of North Carolina organize annual visits to military bases across the Carolinas. Coaches, players, TopCats and Sir Purr participate in every visit, interacting with troops for special recognition and shared experiences. At home games, the Panthers host the Row of Honor. The Row of Honor is a distinctive row of eight seats reserved for active duty service personnel and veterans. Seats 1-6 have a digital camouflage design, while seats 7-8 are unique. In addition to being camouflaged, seat 7 displays the crest of the Military Order of the Purple Heart, and a Purple Heart recipient sits there each game. Seat 8 is ceremonial black and honors POW/MIAs. In tribute, this seat remains permanently unoccupied. Visit the Panthers website for more ways it pays tribute to service personnel.